This incredible journey of discovery gives you the rare opportunity to feel the pulse of this extraordinary country. 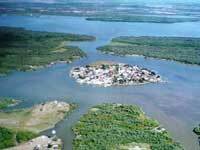 Our first stop is the historical settlement of San Blas, a tropical area surrounded by rainforests and mangrove wetlands where you'll experience La Tovara, one of the world's most diverse reptile and bird sanctuaries. 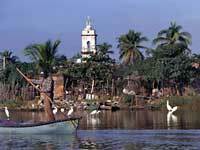 Next we'll travel to Mexcaltitan, an island surrounded by a Nayarit coastal lagoon. Legend has it that this was once known as Aztlan, the cradle of the Aztec civilization - the birthplace of the Mexican people. Past Mexcaltitan, we'll explore a variety of genuine Mexican villages rich in history and cloaked in legend, where you?ll experience the heart and soul of this bewitching and sometimes perplexing land. The day ends on a high note as you clink champagne glasses and enjoy a breathtaking 45 minute return flight to Puerto Vallarta. Expect a magical day, and an entirely enriching adventure! Includes: Lunch, Beverages, Round-trip flight to San Blas, air-conditioned land transportation, Bilingual Guide.